April has been a blur. If I didn't know it from the backlog of paperwork on my desk...or the view out my windows of an unkempt jumble of verdant growth, dead leaves and rampant weeds that is my garden...the fact that it is the last day of the month and I only have two blog posts to show for the month would make it abundantly clear. Since it has been pouring rain for the past couple of days (making yard work pretty much impossible)...and paperwork isn't really my favorite thing to do (to put it mildly)...I thought I would take a moment today to remedy the last situation and post to my blog. After all...it isn't as if I haven't been eating or cooking for a month. I have in fact been doing a lot of cooking. My business...hence my busy-ness...is of course all about cooking. Furthermore, April marks the opening of the farmers' market...one of my favorite moments during the year. 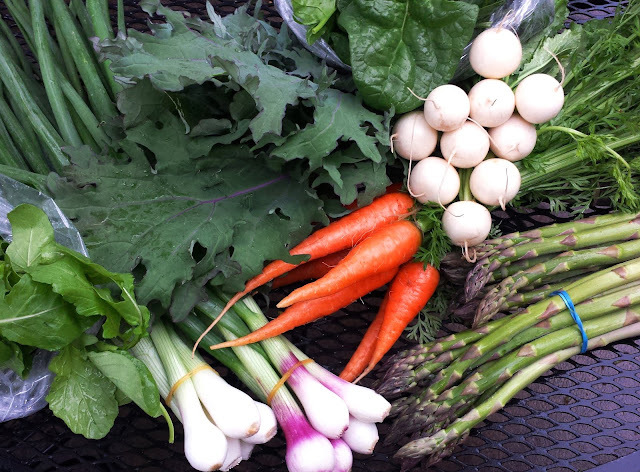 Despite my hectic schedule, I have made sure not to miss a market...and as my Instagram feed will attest, I have been busy cooking the spontaneous and simple foods of the early days of spring for my own table. One of the things that I try to teach in my classes...and here on my blog...is mastery of basic methods and building block recipes. That way, when you are busy...or come across some fantastically beautiful ingredients that you really want to use, you don't have to stop and look for a recipe—or struggle to follow a new recipe—you can just cook. The meal we had last night is a perfect example of this. 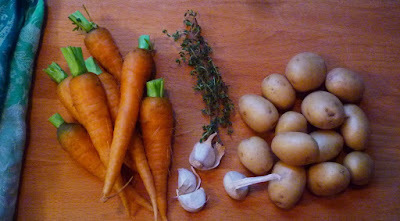 At yesterday's market I brought home some beautiful young carrots that still had a shock of pristine tops attached. It seemed such a waste to cut them off and throw them into the compost pile. As I looked at them, I remembered my friend Nancy had told me about a wonderful dish of roasted carrots and carrot top pesto that she had made last summer. I looked up the recipe I thought she had used...but, I didn't really need to. I know how to make pesto... So I did. 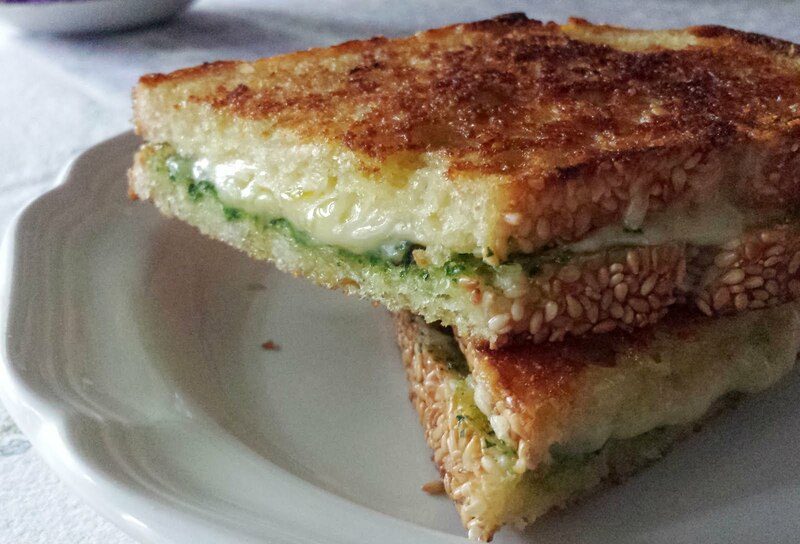 I had also brought home the first arugula of the year...so I added some of that to the pesto. And remembering how much I loved pistachios with the carrots in a raw carrot salad I posted in February, I decided to use pistachios instead of the more common walnuts or pine nuts. You could of course use basil instead of arugula...or the walnuts or pine nuts... All of these things would produce pestos with different flavors. But if made with the proper method...and seasoned well...they would all be delicious—and perfect with roasted carrots. 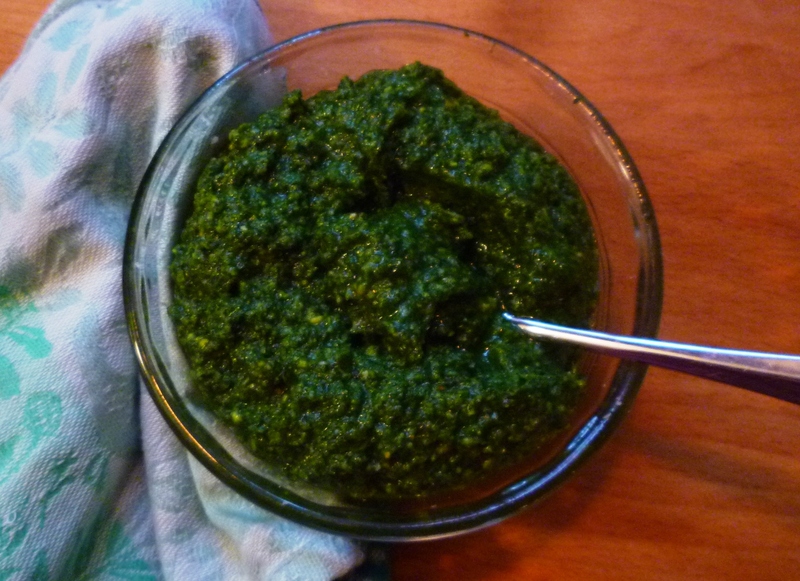 If you don't know how to make a basic pesto, take a minute to compare the recipes I have posted over the years—basil pesto, arugula pesto, spring herb pesto and kale pesto. You will notice that they are very similar...and the method is always the same. To begin, place the greens/herbs of choice in the food processor with the garlic (smashed to a purée with a pinch of salt or finely grated on a microplane zester), the nuts and some salt. Process everything until finely minced (doing this before you start adding oil will give you a more finely and uniformly minced final pesto...if you like a roughly chopped, chunky pesto, it isn't so crucial). Then, drizzle in the oil while the machine is running and pulse in the cheese. Taste and correct the seasoning with salt. Sometimes pesto needs a splash of lemon juice to lift the flavor...and you can add it at the end. When I was making my carrot top pesto yesterday, I had it in my head that it would need lemon...and had the lemon out and ready...and then it didn't need any. It was fantastic: savory, nutty and rich. I will be making carrot top pesto again. 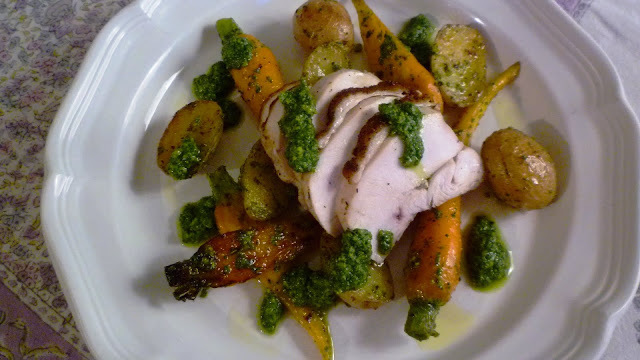 The rest of our meal was also comprised of basic building block recipes: a simple roasted chicken breast and a pile of roasted carrots (of course!) and baby potatoes. If you don't know how to roast a chicken breast, check out the basics post I wrote a few years ago. It is a useful thing to add to your repertoire (and it isn't nearly as tricky as roasting a whole bird). The roasting method I used for the young vegetables is from John Ash's From the Earth to the Table. I ran across it many years ago and I use it all the time for young root vegetables. I don't know if I have ever posted about this method for the vegetables or not. It is very easy. Simply toss them with salt & pepper, bruised/crushed cloves of garlic, thyme sprigs and a liberal splash of olive oil and then spread in a snug single layer in a baking dish or rimmed sheet pan. Cover tightly with foil and roast in a moderately hot oven (375° to 400°) for 20 minutes. Then, uncover them, give them a shake (or turn the vegetables over with a spatula/pancake turner) and continue to roast until they are tender and lightly caramelized—another 20 minutes or so. This method conserves the moisture of young vegetables (and perfumes them with garlic and thyme)...but still allows them to caramelize a bit. I used the pesto to tie the vegetables and chicken together: I tossed the vegetables with a small amount of the pesto. Then, to make the pesto into a sauce I could easily drizzle and dollop over the whole plate, I deglazed the chicken pan (another great, basic technique!) 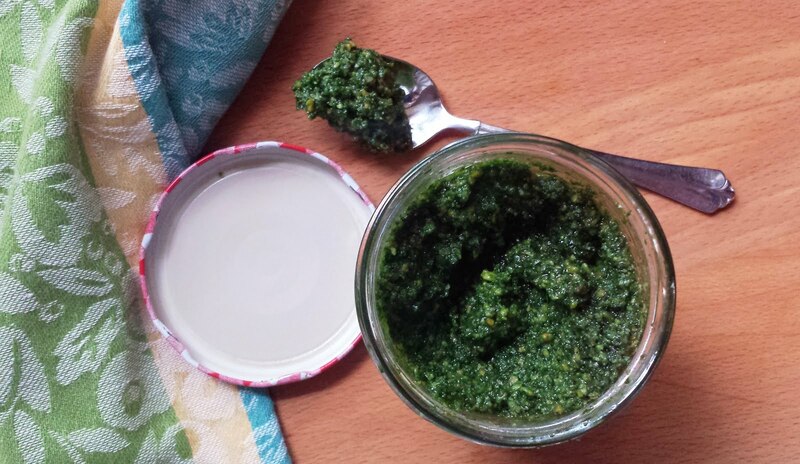 with a splash of water and used the result to thin a few tablespoons of the pesto. Everything came together very nicely, making for a reasonably quick, spontaneous and simple, seasonal meal. Purchase split breasts (on the bone...with the skin). I think a 12 ounce breast feeds two people adequately...but you should purchase the amount that works for you. If you have time, season the chicken the day before with 1/2 to 3/4 t. kosher salt per pound of meat. Cover loosely and chill overnight. Pull the chicken out of the fridge and uncover about an hour before you want to cook it. Prepare the vegetables as directed (below) while the oven heats. Transfer the vegetables to the oven and start the chicken. Prepare the chicken: Set an oven proof sauté pan that is large enough to accommodate all of your chicken over moderately high heat. Season the chicken with freshly ground pepper. When the pan is hot, add enough olive oil to lightly film the pan and add the chicken skin side down. When the skin is browned and crisp, add some butter (about a teaspoon per breast) to the pan along with a few sprigs of thyme or a scattering of thyme leaves. When the butter has melted, turn the chicken over—making sure you swipe the skin through the melted butter and thyme as you do and transfer to the oven with the vegetables. Roast until an instant read thermometer inserted in the thickest part of each breast reads 150° to 155°--about 20 to 25 minutes. Transfer the chicken to a plate and let rest for 10 minutes or so—the internal temperature will continue to rise as the chicken rests and will easily reach the safe temperature of 160°. Meanwhile, pour any excess fat off of the pan and return the pan to the heat. Add a few tablespoons of water to the pan and bring to a simmer, scraping the pan with a flat wooden spoon to release all of the caramelized bits. Set aside. 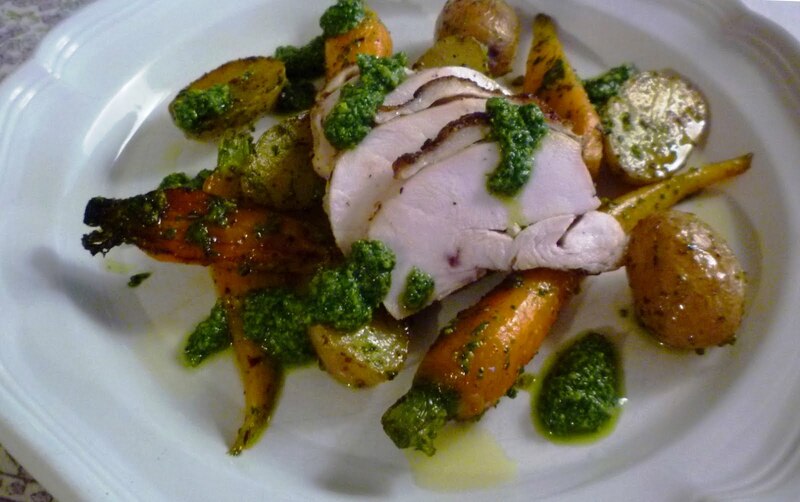 Prepare the pesto while the chicken and vegetables roast. You will need 2 to 3 tablespoons of pesto per person. The rest may be saved (covered, in the refrigerator) for another use. When the vegetables are almost done, use your hands to pull the bones away from the breasts, starting at the point where the breast was attached to the wing. Add any resting juices from the plate of resting chicken to the pan of deglazings. To serve: add some pesto (a half tablespoon or so per person—more or less, to taste) to the pan of roasted vegetables and carefully fold in with a rubber spatula. Thin the remaining 1 1/2 to 2 1/2 T. pesto per person with as much of the deglazings as you like to obtain a drizzling/dolloping consistency. (You may also thin with olive oil...or even water...if you like. If you use olive oil or water, recheck the seasoning after doing so.) Slice the breasts at an angle, across the grain. Arrange the vegetables on a large serving platter or individual plates and fan the meat on top. Drizzle/dollop the platter/plates with pesto, serving any of the pesto that has been mixed with pan deglazings on the side, passing at the table. Preheat the oven to 375° to 400°. Scrub the potatoes. If they are more than an inch in diameter, halve them. If the carrots are small, leave a half inch or so of the green. If they are fatter than an inch in diameter, halve them lengthwise. If they are long, simply cut them into 1 inch pieces. In a large bowl, combine the potatoes, carrots, garlic and thyme and drizzle liberally with olive oil and season generously with salt and pepper. 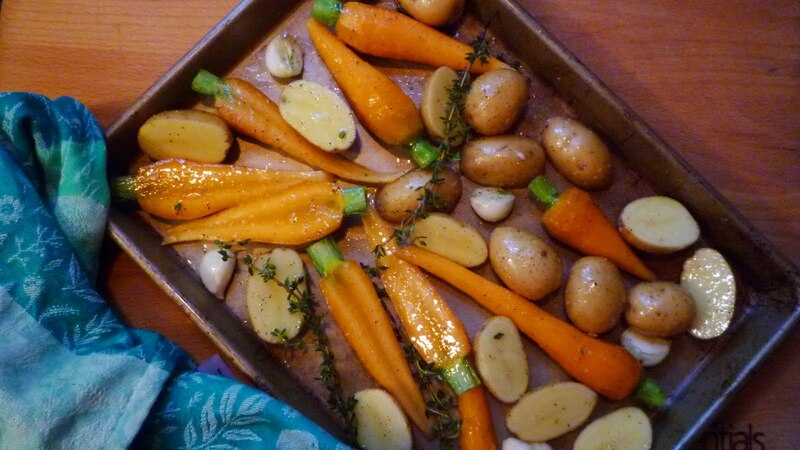 Arrange the vegetables in a baking dish, roasting pan or rimmed sheet pan that is just large enough to hold the vegetables in a snug single layer. Cover the pan with foil and roast until the vegetables are tender and lightly caramelized—removing the foil after about 20 minutes and giving the pan a shake to redistribute the vegetables—total cooking time will be about 40 minutes. Before measuring the carrot tops, trim the feathery fronds away from the thick, ropey stems. Discard the stems and use the tops only. 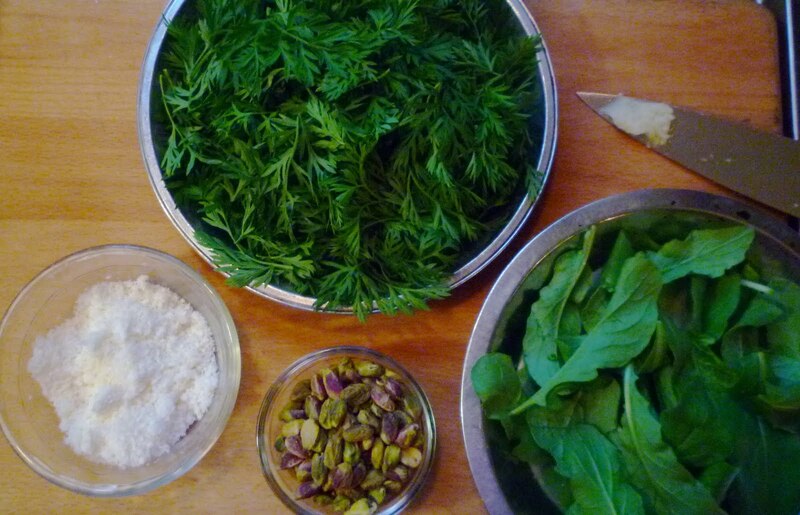 Place the carrot tops, arugula, pistachios, garlic and 1/2 teaspoon of salt in the food processor and process until everything is finely and uniformly chopped. With the machine running, drizzle in the olive oil. Scrape down the sides. Add the Parmesan and pulse to combine. Taste and correct the seasoning with salt and lemon juice if necessary. If the pesto seems too tight, drizzle in a bit more oil. Makes 1 1/4 cups pesto. Store in the refrigerator in a jar with a tight fitting lid and filmed with oil.